The first 318 built by Skater made its debut at the Miami boat show this past February. 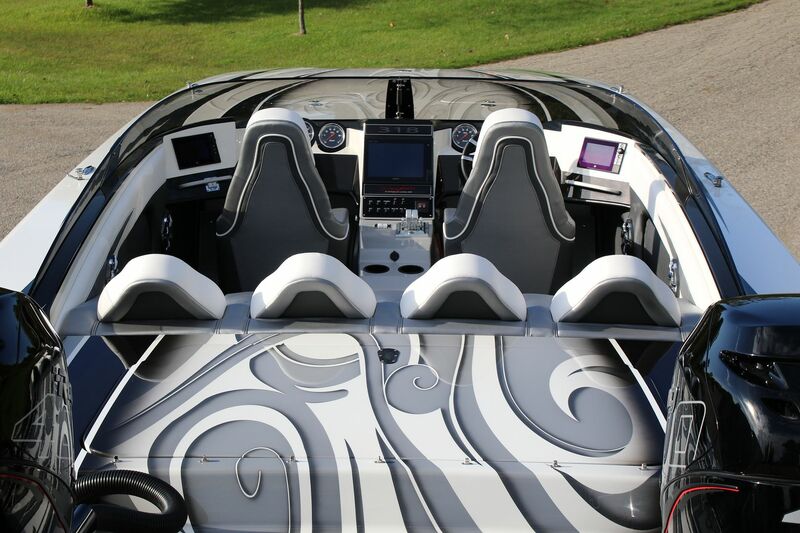 (Read about it here: Skater 318 ) It was a complete success, and the rough water design built into hull #1 has impressed numerous riders around the performance boating world. But, when it comes to Skater, the legend never rests on his laurels and custom tweaks are day-to-day normal occurrences. So, along comes hull #2 which will run more often in on-shore waters versus the offshore home of hull #1. For Peter, challenges are always seen as just another opportunity. At 31’ long, with a 10’2” beam and a 62” tunnel the 318 is not a small boat. It handles six people in high back seats and has a large storage locker behind the rear seat. 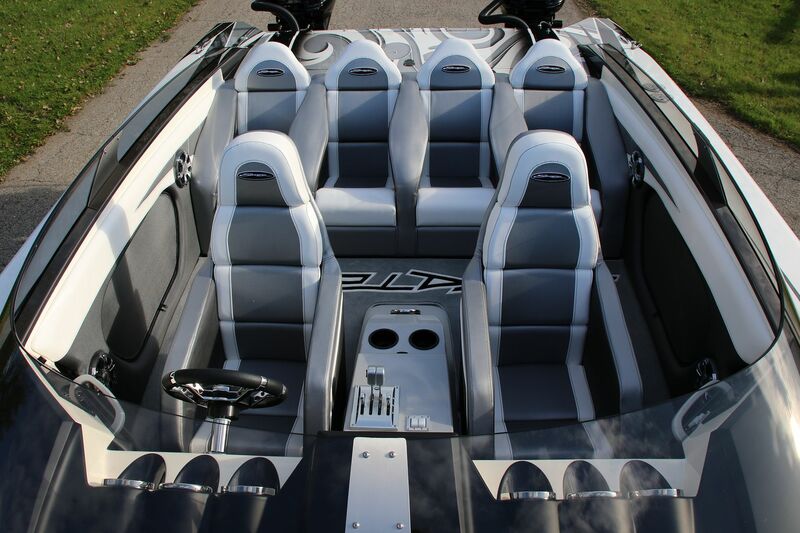 The second hull has a notched transom, and a long, low, sleek windshield. 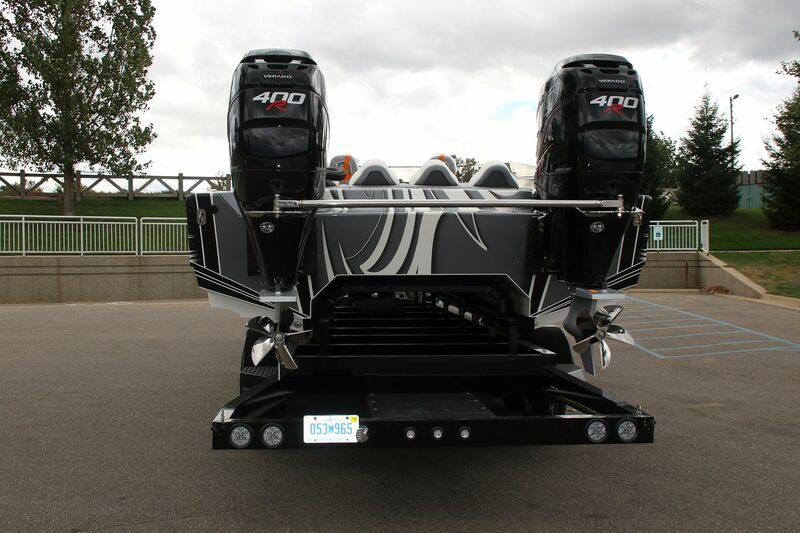 Once it was complete, and a couple of short check-out runs were performed close to the Skater factory, the boat was loaded up on its Skater tri-axle trailer and off to Mercury Racing it went, with Peter along to assist, review, and contribute. The weather was completely uncooperative, but Mike Griffith, Mercury Racing’s test drive expert, accompanied the boat to the north end of Lake Winnebago to try and find some waters a bit less rough. It was a bit less rough, only 1 ½ to 2’ waves with 35 mph wind gusts. So, the test was unable to go for absolute top speed, but the boat was put through its paces at speeds up to 114 mph. Mike said it was an incredible handling boat, and its abilities to run that fast in those swirling winds was extremely inpressive. The boat came up on plane no problems, even with the 400’s at neutral trim. His prediction was that, with the current props, the boat would run around 118 to 119 in better test conditions. After a thorough tour of the Mercury Racing facility, the boat was brought back to the Skater facilities in Michigan. Then, a break in the weather allowed the opportunity to do a bit of testing on Lake Michigan. Having the conditions on the big lake was a bit of a lucky break, and not one to be squandered, so out for a couple of speed runs it went. With Tyson Garvin testing, 120 mph was the top speed recorded on the GPS. The engines were on the 7000 RPM rev limiter at that speed, so larger props would be needed to go faster. But, this boat was built as an all around pleasure boat so putting in a smaller person, removing the extra seats and side panels, putting less fuel in, raising the drives to where it would need negative trim to get on plane, and putting on a larger prop seemed to be a bit of a waste. Leave all that up to others who only have a single goal. 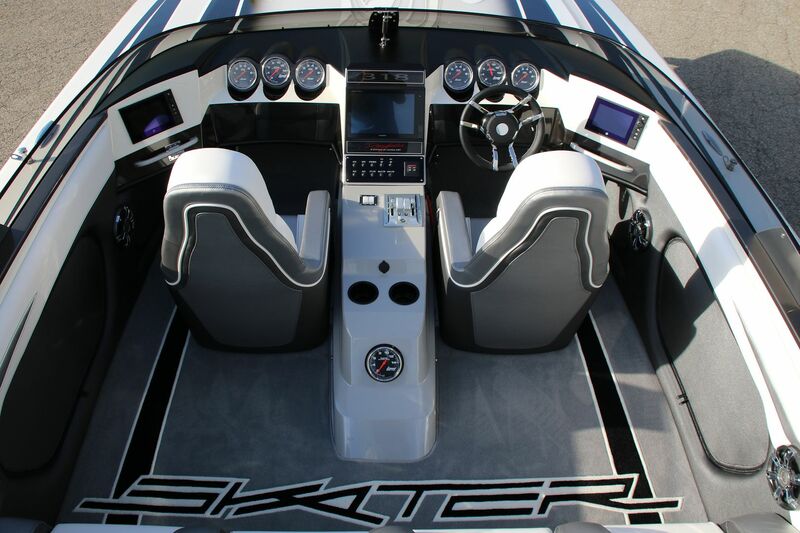 It’s not too much of a surprise to some of us that Skater has built a boat that feels like an Italian sports car on both smooth and rough water, can haul six people in comfort similar to a German luxury sports sedan, and utilizes American power which carries up to a five year warranty. World Class results attained once again. Awesome to see these progress, thanks for the article. I was amazed by hull number 1 when I saw it in Miami. It really isn't a small boat. Thanks Paul for taking us along for the test ride. The combination of the design and the power is special. The quarter angle shots... like the last one heading out on Winnebago are great. That boat leaves an impression like when you first saw that 1967 Corvette for the first time. There are a lot of sweet Skaters, don't get me wrong. But this one stands out. I think it looks really good behind my truck. But Peter won't give it to me. The boat was taken back out this morning with 34" pitch props and hit 122MPH. Water was absolute glass, so slow water. Still on the 7000 RPM Rev Limiter. Another beautiful interior from Appearance Products in Grand Rapids, Michigan.